Have a great idea for a book but you aren't sure how to get started? Or maybe you need to a return to a project that has lain dormant for a while -- for whatever reason. Sometimes the trickiest part of writing is simply beginning. You can't finish what you don't start, but there is something overwhelming about the blank page or empty screen. And revisiting a manuscript you abandoned a while ago dredges up all kinds of fears and worries. So how do writers cope? How does one motivate his/herself to sit down every day and keep going? 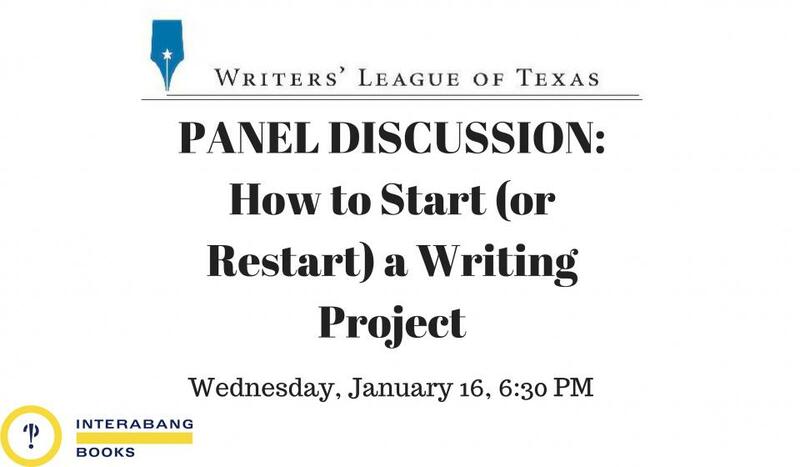 For this panel discussion, WLT Executive Director Becka Oliver will be in conversation with three accomplished authors who have each been there, done that and are happy to share their guidance and advice with fellow writers. J. Suzanne Frank trained as a newspaper and magazine journalist. A “third culture kid,” she grew up in Europe, England, and the United States. She has traveled extensively in Egypt, Greece, and Israel for research. She is a resident of Texas and lives in Dallas. She is the author of the History Quartet: Reflections in the Nile, Shadows on the Aegean, Sunrise on the Mediterranean, and Twilight in Babylon, all time travel stories featuring 20th century heroine Chloe Kingsley and her time traveling husband Cheftu as they move through and influence pivotal points in Western Civilization’s recorded history. Frank also wrote a series of light mysteries featuring fashion stylist and amateur sleuth Dallas O’Connor. For the past twenty years, Frank has taught adults how to write novels through The Writer’s Path at SMU, where she is currently the Program Director. She published “Laws of Migration” the first of a contemporary series about three female ornithologists and their intersecting lives and choices in 2013. In 2018 she began her own branded “Destination: Writing Workshop” series, in Le Marche, Italy. She is now working on the second Quartet featuring Chloe and Cheftu. More than twenty years ago Kimberly Willis Holt stopped talking about wanting to be a writer and started to pursue her dream. Because of her family's Louisiana roots she considers herself a southerner, but her father's military career took her to places beyond the South, including Paris and Guam. Holt’s books are for a wide range of ages, from picture books to middle grade and young adult novels. Her stories have won awards and honors, including the National Book Award for Young People's Literature for When Zachary Beaver Came to Town. Her twentieth book, The Lost Boy’s Gift debuts in April. Today she writes and gardens in a small community in the Dallas/Fort Worth area. Jeramey Kraatz is the author of The Cloak Society and Space Runners series from HarperChildrens, the latter of which was recently added to the Texas Library Association's 2019 Lone Star reading list. He is also a Script Supervisor at Funimation Entertainment where he has adapted hundreds of anime episodes and films for English-speaking audiences. This includes scripts for blockbuster franchises like Dragon Ball Super and My Hero Academia (currently airing on Cartoon Network). He's a graduate of Texas Christian University and the MFA Writing Program at Columbia University, and lives in Texas with, predictably, two cats.